You’ve spent half the season being told to avoid this and that, and what to eat instead, and how to meditate to make not eating Aunt Ellie’s red velvet cake bearable… you’re not alone. But we’ve got a different kind of holiday survival guide for you, one that’s infinitely more fun (and delicious). Instead of telling you what not to eat and drink, we’re going to give you some suggestions for what you should be eating this holiday for beautiful skin… and it’s not just celery, we promise! Feel free to indulge in grandma’s incomparable roast turkey. Not only are you getting your lean protein in, you’re also getting a healthy helping of carnosine. Carnosine is a super anti-aging ingredient. It’s an amino acid compound that not only fights cosmetic aging, it also does a number on bad cholesterol and even fights arterial plaque. Turkey is also a great source of zinc, which boosts collagen production. If you want to further support the production of collagen your skin needs to stay elastic, youthful, and fresh, check out our daily (drinkable) collagen supplement. Cinnamon is one of the holiday’s most prevalent spices and few things make us feel as festive as its sweet, spicy scent. The good news is that its invigorating qualities go far beyond your sense of smell. Cinnamon also stimulates blood flow, especially capillary blood flow, which keeps your skin supplied with the oxygen and nutrients it needs to give you that perfect holiday glow. Mom’s savory stuffing has an herbal essence to die for, but you’ve been counting carbs so maybe you were planning to skip it… well, think again. This aromatic herb is also renowned for its circulation enhancing qualities and is also known for its ability to renew and refresh tired skin. Our ORMEDIC balancing bio-peptide crème is another way to rejuvenate tired, stressed skin. We know you’ve been looking for an excuse to drown in pumpkin spice and you’ll be delighted to know we have one! Not only will you be getting a delicious dose of skin soothing cinnamon, you’ll also be loading up on vitamin A and vitamin C, both of which do your skin a world of good. 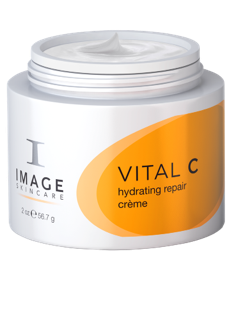 If, for some terrible reason, you don’t love pumpkin, hit up our VITAL C line to energize your skin. Our VITAL C hydrating repair crème is perfect for keeping your skin fresh, even when you’re sleeping in your cousin’s old bedroom for a week. These holiday favorites are also great sources of vitamins A and C and are full of fiber to boot. We can’t speak for the skin health benefits of the toasted marshmallows atop them, but we all have to make sacrifices to celebrate the season! Eggnog is perhaps the most decadent drink of the season and we’re thrilled to tell you it’s also packed with vitamins, protein and calcium that make your skin and hair happy! You might want to keep an eye on the calorie count, but a moderate amount of this rich, seasonal drink is absolutely good for your skin! Dust the top with cinnamon for even healthier skin!